It's no secret that the empty calories in soda and other sugary drinks can contribute to weight gain and obesity. But a new study suggests these beverages also may harm your heart, even if they don't cause you to gain weight. The association could not be explained by obesity or weight gain alone. The researchers took into account the men's body mass index, along with their dietary habits, exercise levels, family history of heart disease, and other extentuating factors. Sugary-beverage consumption "appears to be an independent risk factor for heart disease," says lead author Frank Hu, M.D., a professor of nutrition and epidemiology at the Harvard School of Public Health, in Boston. Several factors besides body weight—or, more likely, a combination of factors—could explain the findings, Hu says. For instance, he says, sugary beverages have been linked to high triglycerides and low "good" cholesterol (HDL), which could increase heart-attack risk without being accompanied by obesity. Sugary beverages also are believed to promote inflammation, an immune-system response involved in both heart disease and insulin resistance, a major risk factor for type 2 diabetes. 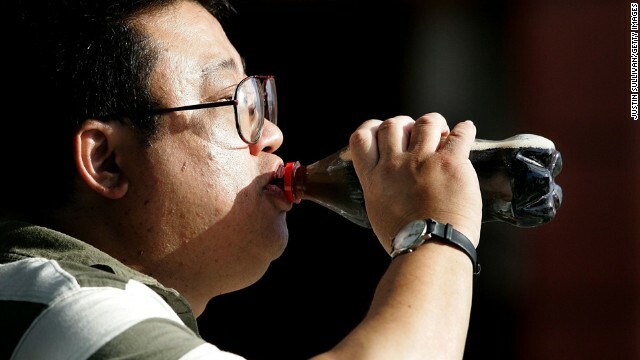 Finally, Hu says, sugary drinks have been associated with the accumulation of belly fat, which can increase a man's risk of heart attacks even if he isn't obese. The study had some important limitations. Most notably, the researchers measured beverage consumption every four years using food questionnaires. Although this is a commonly used research method, it relies on the study participants' memory and is therefore less than exact. "We already know that sugary beverages are associated with increased obesity, type 2 diabetes, and other metabolic issues," Hu says. "This adds further evidence that sugary beverages are detrimental to our health." High fructose corn syrup – stay away from it. I could probably count the number of sodas I've had in the last 8 years on the fingers of one hand. Every time I had one it tasted so sweet it didn't have any flavor. I've heard a thousand times – don't drink soda, and they all end up discussing sugary beverages! Haven't these idiots ever heard of diet soda, NO sugar, No harmful dyes, etc. I'd REALLY like info on diet beverages! I am so glad that I stopped drinking sodas back in 1993 and have not had one in 19 years. My nutritionist calls sodas "liquid candy". Since 1993, I have only drank coffee, green tea, fat-free milk, water and an occasional glass of red wine. Those all sound much tastier than soda anyway! Yum! umm... the coffee is probably worse for you than soda. I'm curious if they have studied people who drink fruit juices regularly. Most of the fruit juices I've seen have more sugar per volume than Coca-Cola, even the ones that are 100% juice. vb: Studies on coffee are pretty mixed; there are pros and cons. I wouldn't advise anyone to start drinking it if they don't already, but compared to the huge sugar loads from soda, which are unambiguously bad, coffee would seem to be a lesser of the two evils. This is very good, another practice that may increase our heart attack risk. But I believe I have already heard this one before alongside the countless other don-nots. Since the term sugary drink infers any liquid (water) with sugar added would fit this study. So sugar is the culprit. Wonder why one's body reacts negatively to a naturally growing plant. Practically every thing man eats contains sugar or something sweet. We are all doomed. I wonder if they looked at the type of "sugar". It's not just sugar which is the problem. It's fructose in the absence of fiber. Sucrose breaks down into glucose and fructose shortly after consumption, so sucrose vs high-fructose corn syrup is not an important distinction. The real problem is that when you consume either, you generally do so without the fiber your body needs to properly process it. When you eat fruits or vegetables, you do consume sugar, but you also consume a lot of fiber, which just isn't the case with soda or juice. Most brands of soda are loaded with GMO-based, high-fructose corn syrup – that is, highly processed sugars made from crops that have been genetically modified to produce toxins within the plant in order to act as a pesticide. But hey, even if the crop itself is poisonous enough to kill any bug foolish enough to have a taste, I'm sure by the time it gets into my Coke it's perfectly safe for human consumption. It's probably the high fructose corn syrup in sodas that's bad. It's probably not the sugar but the huge concentration of sugar in a soft drink. Even if you drink fruit juice, the amount of sugar is bad. Drinking a glass of orange juice is like eating dozen oranges. Moderation is the key to life. And, throw away the stupid sodas. Just because something is natural doesn't mean it is healthy or safe. Cyanide is "natural", cocaine is "natural". Our bodies were never meant to handle the amount of sugar we put into them, especially not industrialized processed sugars like HFCS. And plenty of people don't eat sugar in nearly everything they eat. Water is always the best option. Really?!? Hey if you want a soda and you have a free will then by all means have a soda. If you don't have a free will then by all means be miserable. I very rarely have soda now, preferring water when I go out to a restaurant or drive thru. Always too sweet and a horrible after taste. There is a VP at my office who drinks 8-10 cans of coke a day. He is definitely addicted as he starts off the day with one, just like a smoker and a cigarette. i had a boss like that too a while back..she was a skinny thing and all i ever saw her drink (or eat for that matter) was diet cokes and DanActives. A leading study showed that the leading cause of Death... is being born. Once you've been born, just about everything we do these days is bad for our long term health it seems. Don't drink juice either. It's no less evil than a soda. I find it appalling that juice manufacturers advertise their product as better and convenient than a fruit. This clearly sends a very wrong message to children and teens. Why do seemingly healthy people drink this much sugary fluid? Taste and marketing may explain brand choice but not the why? I tend to drink mostly at work to help keep up the pace during the day.. Whether it's the sugar or the caffeine I don't know, but I think ithelps keep me going. Why do I need it? The CDC says that 20-30% of US adults feel tired most every day. That fits me as well. How about you? Is it the soda or is it the high fructose corn syrup? No one wants to test the high fructose corn syrup directly because it is in so many products and sales contribute so much cash, but it would be useful to know if there is something specific to soda that causes the problem. What about diet soda? I think that drinking more h2o warter is much beter and the way to go than drinking others. For God gave his vaery bast and much of it too!.. SOoo be hellthy and drink right knowe God!!.. Amen . So you didn't see the study that showed that the highest risk for premature death was among abstainers from alcohol? Moderate drinking, if you can do "moderate" is the healthiest, and, interestingly, the heaviest drinkers still had a lower risk of death from all causes over time than those who abstain from alcohol. The only reason I'll drink soda is if you mix it with bourbon, first. Coke's secret is to put as much sugar into it as chemically possible – any more sugar and it would solidify into candy. But this study has so many variables left out it's almost useless. Are they talking about soda or all drinks? Did they really only study a handful of white males? What did all these men do for a living and what other factors did the men have for being at risk for heart attacks? How long was the study? It's irresponsible to present an article that is so incomplete. We all die some day. I'll enjoy my Coke and see you all on the other side. Wait a minute. I thought it was all that bad fat, like ribeye steaks, movie theater popcorn made in coconut oil, french fries made in beef tallow, lard for frying chicken, and of course BACON along with other and delicious animal and natural saturated fats that caused damage to the heart. I mean, a nice refreshing cola is fat free. Now that's killing me. Break out the bacon, honey, cause we're going to party like it's 12/20/2012. Finally a poster with some common sense and a sense of humor at that. The sheeple sure do get whipped into a frenzy and panic. There are bigger worries threatening them for what they put in the pie hole. Eat for energy.If one has to drink any beverage,pop any pill,or consume anything other than food to give their body the energy that is required for them to make it through the day then I believe a change of diet is required. When you cut out sugary beverages you are left with water, diet drinks, coffee, tea and milk. If you are lactose intolerant and want to avoid caffeine you are left with water, diet drinks and herbal tea. if you read the stories about diet soda and artificial sweeteners, you are left with just water and herbal tea. One of the reasons that folks drink "sugary drinks" is that there aren't any drinks other than those listed that aren't sugary or bad for you in another way. These stories about "sugary drinks and soda" make it seem like folks are choosing these over an array of other more healthy choices. Although the evidence suggests that sugary drinks are indeed bad for you, it is a bit bleak to think that you can only drink water and herbal tea for the rest of your life. Note: juice counts as a "sugary beverage". Also to add to your point tea actually contains a decent amount of caffeine. Not as much as coffee but it does have a decent bit. And why is water so bad? I drink a atleast a gallon a day. Water is the source of all life, why not have as much of it as you can. And if you find some natural orange juice with no sugar added, that is pretty good for you. The natural sugars found in real fruit and fruit juices are not bad fo you. Most people see the word sugar and associate it with the sugar in coke, when it actually is different than that kind of sugar. Now juice boxes, Hi-C, and the like are terrible for you. You are pretty much drinking flavored sugar. Also beer and wine, in moderation, are good for you as well. You can drink juice! You can juice your own fruits and vegetables and even sweeten them more with honey or stevia and you can invent all the flavors in the world if you want. You can also make flavored soda water this way. Let's not forget that there are literally hundreds of herbal tea kinds, that taste very much like flavored drinks, either with all natural real ingredients, or even more when you include those with natural or artificial flavors. Also there are non dairy milks from nuts and seeds, (not only soy). The choices really are endless. But it doesn't appeal to the public because they're all too lazy to take 5 minutes to MAKE a drink, as opposed to just buying it. I have a juicer at home and make natural fruit and vegetable juices a few times a week. No sweetener needed! I can't even buy fruit juice from the store anymore. Tastes like plastic. Although I appreciate Kathy's response, it really is quite annoying. I am lactose intolerant. I hate and I do mean HATE warm drinks - teas, coffees, hot cocoa whatever. I'm also not a big soup person. I hate diet soda and it left a horrible after taste. I don't like coconut, pineapple, and several other fruits and am allergic to peanuts and other nuts as well. I tried switching to some of the other drinks mentioned and they contain Aspertame, and if you aren't familiar with Aspertame, everyone should educate themselves on it. It's even in most gum. I drink water - on occasion - but frankly I'm not a large fan of that either. So, no soda isn't the best thing for you and it does put on the weight and it is guilty of a lot of things, But at least I'm able to get my caffeine fix which is desperately needed with 4 children and gets me moving. I agree with several of the other poster's here. Until more flavorful drinks are on the market with less chemicals, etc., there are some of us who are just simply screwed in terms of alternative drinks. And soy? Really? Have you drank soy? Maybe it's just my taste buds but I'd rather eat my cereal dry than have to add most of these lactose free alternatives. Yuck. To all those that worship the almighty "Soda'. it doesn't come any clearer than this. Soda = Obesity, heart risk. on the other hand natural drinks from pure rain water to organically harvested fruit juices and "Coffe and tea" aer the only liquid to be sipped by mankind and ocassionally wine and some drinks. Last time I checked, Coke sold in Mexico and south America as well as in US supermarkets that specialize in Latin foods contain pure sugar...no fructose or other sweetner. I wonder why? That's where and why we buy our colas locally. mex cola has cane sugar insead of fructose. not sure what you mean when you say "that is why i buy locally." the cane sugar cola is probably better for you and much better tasting. Purchase it at a local Hispanic market! Only 20% additional risk? I don't think that is enough for me to give it up, specially when they could only account for factors they could think of. Even then, it is nearly impossible to prove causation through a statistic. It's possible that something like stress caused the 20% risk and it just happens that stressed people drink more soda. These “jump to conclusion” headlines don’t help people make good choices. One scientific study is like one piece in a 1,000-piece puzzle; you need hundreds to understand the whole picture. While large diet studies are a good first look at a population, they don’t tell you what factors cause an outcome. In this study, the men had higher levels of triglycerides and less good cholesterol, both which could lead to heart disease. From the literature I’ve read, the big picture is that the path to a healthy life and weight includes various foods/drinks and regular physical activity. When exercise is coupled with healthy eating, there is no need to eliminate soda or other foods/drinks from your diet. That why I tell my clients, including individuals and companies like Coke, that all foods can be enjoyed as part of a healthy lifestyle. So tired of "this may increase heart attack risk" or "that may increase cancer risk". These are all "after the fact" studies with NO isolation of cause and effect, and no consideration for complicating factors. Why not say "men who have a history of drinking more than one soda per day have a higher incidence of heart attack"? That is different from "one soda per day increases heart attack risk". Yes, I agree it is confusing to get only the byline. It is also too encompassing isn't it? Too many unanswered questions. Not all soadas do that and what do they mean by sugary? Too watered down and uselss for me too. Should say sodas with high fructose corn syrup tend to cause triglyceride biuld up and this contributes to heart problems, especially in women. A soda a day MAY risk a heart attack which we're ignorantly ingesting listeria, E. coli, botulism and every manner of toxin, additives, preservatives, food coloring, hormones, artificial fertilizers, animal antibiotics, preservatives,........Spare me food nazis. I'm so sick of these sanctimonious a$$ holes sounding alarms. Moderation people and move on. Nothing to see here. Today, bottled water is more expensive then soda. Go figure! I met someone that used to work at the Coca-Cola headquarters. She told me that soda, especially DIET soda, was toxic chemicals in a can and to be very afraid. You might as well put a bullet in your brain. Its much faster and more cost efficient. There are plently of things that are unhealthy for us – the secret is moderation. Don't follow everything that's published in these papers. Inform yourself. I track all my nutritional goals including sugar and fat intake at http://www.shoppinglistgen.com. If you're concerned then take action for yourself! Do they still sell soda with sugar in it? Who would drink it? I haven't tasted a regular coke in 20 years. It has been proved that Coca Cola is an excellent toilet cleaner – it has so much acidity – and morons continue to drink it and profit the coke company . Indra Nooyi , the CEO of Pepsi does not drink her own company's products – she knows better. I drink 2 to 3 cans of Pepsi or Coke a day and have for years. I'm 67 now and enjoy every drop. As for the acid in it, try your own stomach acid if you want something really caustic. I am so healthy now as I have been all my life. So what's the big gripe about? If you want to protect yourself from the world, go live in a bubble. As for me, I'm going to live life to its fullest. Wonderful! I have been looking for this info , thanks for posting, low purine diet. Here I want to point out one thing also "who drank just one sugary drink a day had a 20% higher risk of heart disease" So keep away from Sugary Drink and reduce chances of Heart Disease.!! !